← I’m beginning to hear Wedding Bells! This wonderful batch of goodies came yesterday from Isela! 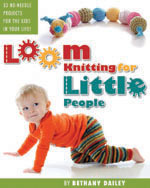 I got my knitted goods back from my designs in, and 2 copies of, the Loom Knitting Pattern Book! 🙂 I also ordered the yummy yarn you see there from her destash sale…don’t you just love those colors? I’m a very big fan of blues and greens…mix them together, and I can’t resist! I think I’m going to have to order an extra fine gauge sock loom to be able to knit up some “every day wear” socks with that Knit and Tonic yarn. I’ll need to do it by July 4th, as Decor Accents is having a sale…check it out here. 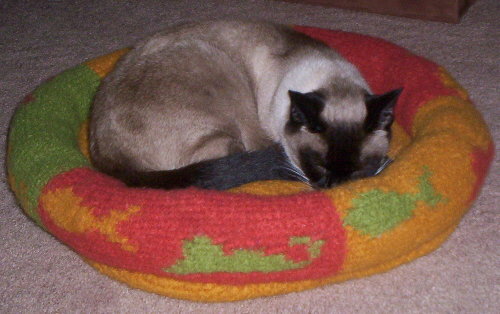 Oh, and here’s one other (not so) little item that was in the box… I think it’s already been claimed for is fuzzy comfort! This entry was posted in Blogging, Blogiversary, Contests, Knitting, Loom Knitting, Looming Patterns. Bookmark the permalink. So glad that you got your package in.